With the TS series, we brought back the lift up door, making even more room to access the inside of the machine. With the TS series, we also introduced some special Fanuc features that weren't available on the older models. Our ground-up redesign that allowed for more modular tooling, higher speed spindles, and a unique, clean design for the oil/chip tank. 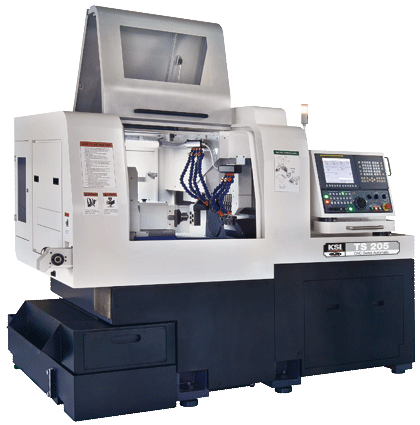 A specialty designed machine that was our first to have a 10,00 RPM main spindle, the most stroke on the market, as well as the most mass on the market for a 20 mm machine. The original 10,000 lb machine. This machine still holds the records for the most mass on the market.